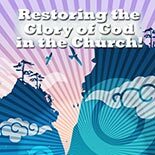 Restoring the Glory of God In the Church! God is not interested in restoring knowledge to His church but His Glory, Power, and Presence. When God's Glory is in a church, all (even outsiders) will see God's presence and power in their midst. God's people will be tasting the powers of the coming age - the same power that raised Jesus from the dead.